WHEN I was once rashly defending Susan Chitty against Michael Holroyd’s attack on her for plagiarism, I was effectively silenced on being shown The Great Donkey Walk, by Susan Chitty and her husband, Thomas Hinde, and challenged to read the references in that book to myself in case I should suppose that Chitty’s distortions of fact stemmed from genuine confusion. Dimly I recalled an Easter Sunday when the Chitty spouses, two of their children and two donkeys appeared at the foot of the stone steps leading up into my garden in Tuscany. We had all heard that the Chittys were dragging their children from Santiago de Compostella to Smyrna on foot and donkey-back in order to write a lucrative book about their ordeal. The route was supposed to be that taken by pilgrims or Crusaders or both, but I’d have sworn neither had ever come within ten miles of my house. Appalled, I threw down my trowel and ran to warn Gay Clifford. She made them welcome, only too happy to feed Montevarchi cake, a high hard dry yellow concoction that peasants give to their friends at Easter, to the pale and sullen little girls who hoovered up every crumb. We were less happy to see the one and only flagon of wine that our straggly vines could produce vanish down Chitty throats before we had fairly tasted it. When our meagre hospitality was exhausted, the sorry little procession continued on its way to Ancona, not only in the opposite direction from any that common sense would suggest, but up an abandoned mule track completely overgrown with brambles and broom. The jibe was not only gratuitous but unoriginal, another of the unacknowledged borrowings so often to be found in Lady Chitty’s work. It was embedded in a tissue of irritating inaccuracies, the name of my house slightly wrong, the description of my holding quite wrong, the name of the nearest village misspelt, all too tedious and inconsequential to correct. More subtle and more misleading is the implication that she knew me much better than she did. When Antonia White was dead and her two daughters were let loose among her diaries, those of us who slightly knew and greatly respected her trembled to think what, given Susan’s track record, she would make of the opportunity. 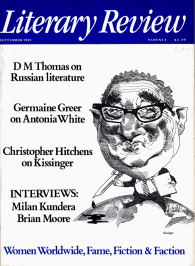 We hoped that after Holroyd’s attack, if not R B Martin’s quiet devastation of Chitty’s biography of Kingsley (Victorian Studies, March 1976) her work would be known to be unreliable and Antonia White’s reputation would survive. Instead we read with amazement in The Sunday Telegraph of Susan Chitty’s ‘respect for truth’. Anthony Powell thought Now to My Mother ‘hardly unjust’. Rachel Billington called the book ‘an exorcism but of a most clearsighted and intelligent kind’. Hilary Spurling found it ‘extraordinarily free of rancour or malice’. None of them doubted that the events described by Chitty happened just as she said or that what she put in inverted commas represented Antonia White’s exact words. Even though Chitty’s treatment of published sources is known to be cavalier, they were happy to believe that she would treat an unpublished and unpublishable source in an honourable fashion. They did not dream that Chitty would rewrite White, marry disconnected passages from the diaries, suppress qualifying clauses and phrases, insert invented material or change names. Such unscrupulousness is not normally to be suspected, yet they might have guessed, from the tawdry use to which the diaries are put, principally as a guide to White’s sexual activity and not as the record of an unusually alert and agonised soul, that what was toward involved a fundamental and unprincipled distortion of her character. Critics of the stature of Spurling, Warner, Powell and Billington ought to have noticed the mangling of Antonia White’s story, The Moment of Truth on pages 68 and 69 of Now to My Mother. Not only is the story treated as autobiography, a risky procedure, it is distorted in the process. They might have noticed the discrepancies between Now to My Mother and Chitty’s earlier statements about White in her edition of White’s short stories, As Once in May. They ought to have picked up occasional bizarreries such as the crediting of Coleridge with an Ode on Discretion, or Basil Nicholson with inventing the strip cartoon or even the statement that Frost in May was seldom out of print, which is nonsense. Now to My Mother bristles with warning signs like these, yet reviewers allowed themselves to trust an obviously sloppy and hurried writer in the far more complex and shadowy area of portraiture of a difficult but by no means contemptible or pusillanimous woman. I have before me the annotated copy of Now to My Mother belonging to Susan Chitty’s half-sister, Lyndall Passerini, together with her seventy-page comparison of diary quotations with their originals. Some of the anomalies are simply crazy and inconsequential, results of haste and muddle-headedness, but others are clearly malicious. For example, Chitty writes that White might have borne Tom Hopkinson’s infidelity ‘if she had considered Kay either as beautiful or as clever as herself, although the diaries clearly state, ‘I feel terribly the lack of beauty. Jealous of F for that’ (28/12/34), and ‘I feel F’s beauty has set a standard for Tom which nothing else can ever equal’ (14/3/35). The story that the diaries tell of the estrangement between mother and daughter is more complex and harrowing than Chitty’s account. White was very aware that there was something wrong with Susan, and that she was powerless to help her. As the relationship between the two women deteriorated White recorded meticulously all the symptoms of Susan’s disorder. ‘My present nagging preoccupation is Susan who for some time has been the person with the most power to make me unhappy . . . She hates living with me . . . ‘ (9/9/50). It is obviously too much to expect of Chitty that she could diagnose her own illness – except of course that her mother had always logged her own madness as callously as she could – but if she were to have forgiven her mother, as critics with no access to the documents have so rashly decided that she did, she would have been moved to mercy by her mother’s anguished recounting of every episode of soiling, stealing and lying, for which she resolutely refused to blame Susan but which she knew she was not strong enough to deal with. The diaries show Antonia waiting helplessly for the rift that must come. Chitty’s assertion that her mother threw her out and had the flat redecorated and changed the locks is a pitiless distortion. If I were to do for Chitty what she did for Kingsley and White, I should interpret her inability to understand her mother’s vulnerability to her as pathological. Susan was so desperate to be Tom Hopkinson’s daughter that she pre-empted and still pre-empts the role of her legitimate sister, denying and rejecting her mother’s love, jealously cherishing every instance of neglect or insensitivity on her mother’s part, unable to face her own guilt for her lack of love for her mother. Her prurient interest in her mother’s sexual relationships and her exaggeration of the degree of sexual activity in which her mother was involved are aspects of the same pathology. Susan Chitty has not forgiven her mother for anything, least of all for having borne her. Chitty’s book is only one part of a complex family case history. To find out why critics were so ready to salute honesty and clear-sightedness in so murky a matter, blithely indifferent to the unverifiability of their conclusions, we would have to inquire deeply into the role of mothers in our society. None of our conclusions would do us credit.